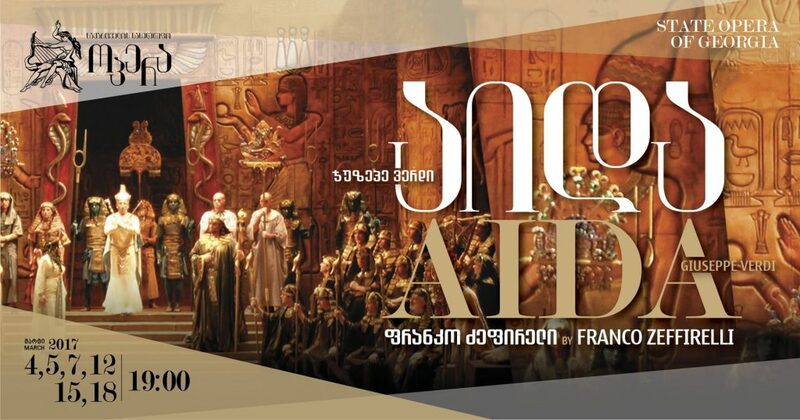 March 4, 5, 7, 12, 15, in the 165–th anniversary season, State Opera House of Georgia exclusively presents the special version of Giuseppe Verdi’s AIDA. For the first time the audience will see the production by legendary Franco Zeffirelli. Franco Zeffirelli first staged his production of AIDA in 2001, in Verdi’s hometown – Buseto. The performance dedicated to the 100th anniversary of Giuseppe Verdi’s death premiered at the Verdi Festival. March 4 – The Georgian premiere of Franco Zeffirelli’s production by will be conducted by one of the greatest modern conductors, internationally acclaimed Verdi interpreter, maestro Daniel Oren. Leading parts will be sung by Georgian soloists: Anita Rachvelishvili, Iano Alibegashvili, Gia Oniani, George Gagnidze, Ramaz Chikviladze, George Andghuladze together with Z. Paliashvili State Opera and Ballet Theatre orchestra and chorus. In Tbilisi, the performance will be staged by Franco Zeffirelli’s assistant Stefano Trespidi. March 5 – the mixed cast will perform the opera. Amneris – Khatuna Mikaberidze, Georgian Mezzo-soprano, soloist Staatsoper Hannover as Amneris and Korean tenor James Lee as Radames will join The State Opera House of Georgia soloists, chorus and orchestra. For the detailed information about full cast of all performances, please follow our website and Official Facebook page.